This is a circuit board made by CTI Electronics that brings a whole new meaning to the words “layout control”! Model railroad computer control used to be very complicated. I remember reading articles about it many years ago and thinking, “You need to be a computer programmer to do this!” Fortunately, things have changed thanks to companies like CTI. The wiring and interfacing with your computer couldn’t be easier. Following the instructions to set up the software is not difficult though it will take some time to do it right. 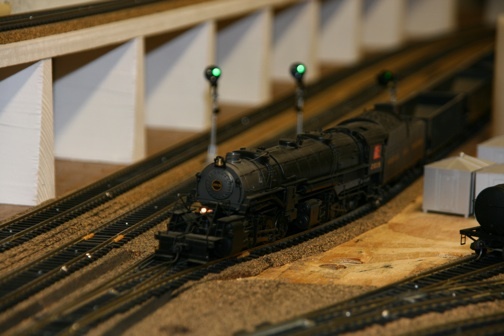 My good friend Bob Fahrney (a retired WWII Navy fighter pilot with a fascinating history), who lives close by, recently introduced me to model railroad computer control, which he has already accomplished very nicely on his HO layout. He showed me his computerized railroad and signal system both of which operate flawlessly. His system is integrated with Digitrax DCC control, but the Train Brain also works well with analog control. Basically the Train Brain connects directly to your computer either through a com port or through the parallel port (where you usually attach a printer) using a cable interface connector. If you don’t have a free com or parallel port to use but you do have a free USB port, you can buy the USB adapter specially designed to be used with the CTI system. You don’t have to modify your trains at all - no special decoders. And you don’t have to change or modify your computer hardware either – no computer cards to install. You will have to install some software on your computer, however, and it works with Windows 98 or higher, but not with Macs yet, unless you have an Intel-based Mac that can use either Boot Camp or Parallels to load Windows (purchased separately). The starter kit, which I would recommend if you’re just beginning your adventure into model railroad computer control, comes with a Train Brain module, the CTI software, interface cables, power supply and 2 sensors. •	Dash-8 – This module can control 8 AC or DC devices. It can be added to the original for additional device control. Controls high current applications (10 Amps). •	Switchman, a general-purpose module, can control 16 devices. It can manage up to 28 volts DC at 2 amps (4 amps pulsed). Good for dual coil switch machines, lighting, solenoids, small motors, relays, etc. •	Smart Cab gives you the option of controlling your trains either manually or automatically, such that your trains can now change speed, start and stop smoothly – all controlled by your computer. •	Signalman module is used to set up computerized signal operation and allows you to automatically operate all your signals, grade crossings, traffic lights, beacons, etc. •	Yardmaster is the module that can control turnout switch machines, including Tortoise and solenoid switches, all from your computer screen. You can control these with your mouse on a regular computer screen, but a touch screen computer would come in handy here. •	Watchman can monitor 8 different sensors, including IR, photo sensors, magnetic sensors and current detection. •	Sentry can monitor 16 sensors. 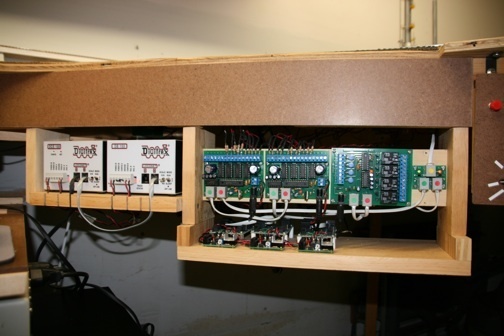 The following is a picture of Bob's control panel showing, from left to right - the Digitrax DCS100, DB150, 2 Yardmaster modules side by side, the Train Brain and the computer interface panel. On the bottom are 3 sensing modules. The wiring between each module and back to the computer is all color coordinated and very easy following the instructions in the manual. Incidentally, other signal systems do work well with the CTI System. 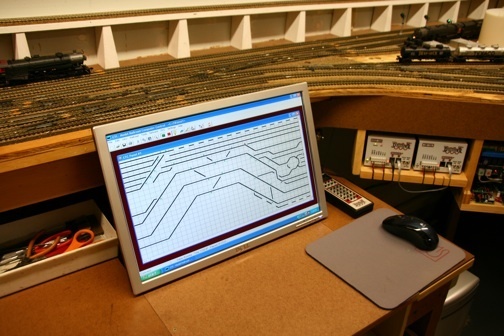 Bob preferred to use the Atlas signal system on his layout and had no problems with it. Another good point is that you can still use your walkaround Digitrax throttle whenever you wish to walk away from the computer screen and follow your trains. The instructions that come with the starter set are very complete. It may be helpful to print them out and create a notebook to refer to as you are setting up the software. As mentioned, the wiring itself is very easy, but setting up the software and configuring a map of your layout on the computer screen will take some time. The effort is definitely worth it, however. You will be awestruck at how much control and automation of your layout that this system gives you. Reference - The CTI Electronics website. From "Train Brain" to "HomePage"
From "Train Brain" to "Special Effects"